University of Texas graduate, Carola Guerrero De León, is a former ESL teacher at Casa Marianella, and most recently, an Emmy award winning journalist at Univision! We spoke with Carola to hear about how her experience teaching English at Casa has helped shape her journalism career, along with how she thinks the media has influenced the refugee crisis thus far. 1. How has your experience teaching at Casa influenced your journalism practices? Teaching at Casa has been one of my most memorable and fulfilling life experiences. We often read the news with headlines saying Refugee Crisis. We share these stories on our Facebook timelines saying, this is so sad or I wish I could help– and guess what, WE CAN! This is why I decided to teach English at Casa as a college student. The people I met there taught me more than I ever taught them. My pity turned into respect and admiration. Now, as a journalist, I try to highlight their strengths instead of their weaknesses when creating headlines and video stories. I want the public to see refugees as the resilient, wise and strong human beings they are. Moving across the world and starting from zero is courageous and I make sure to make that very clear in my work. 2. Why do you think the refugee crisis does (or does not) deserve more media coverage? I don’t think the refugee crisis needs more coverage, but I do think it needs better coverage. We have to better educate our audiences about the factors behind the massive exodus of all of these different groups of people. In most cases, this is due to the colonialism that has exploited the people and economies of various countries in Latin America, Africa and the Middle East. The same colonialism that has disproportionally advantaged the U.S. and West Europe. We have to take responsibility for the system that has made others suffer for our advantage. We have to show the faces and stories of these people more often, as well as the history of their struggle. As a journalist I understand that the people behind the news desks live under constant deadlines and pressure. But as media professionals we have to make sure to treat these sensitive topics with delicacy and intelligence. I feel that national media outlets give too much exposure on erroneous feeling and comments from figures like Donald Trump and Greg Abbott- strong opposers of immigration- therefore the public sometimes hears more from them than from qualified experts on the topic and refugees themselves. 4. Tell us about your Emmy experience and what lies ahead for your career as a Spanish journalist! My Emmy! It was an amazing experience. I do my job not for the recognition, but for my love of telling stories. Nevertheless, this award has definitely served as a motivation to keep on going. I still don’t know exactly what I will be doing after Univision, but do know that I plan to continue serving immigrants through my work. Hopefully, I will be able to do so abroad as a foreign correspondent someday, but for now I plan on staying in Austin for at least one more year. So I’ll be around! We are thrilled to see what lies ahead for our friend, Carola, and we are so proud of what she has accomplished thus far. Congrats, Carola! 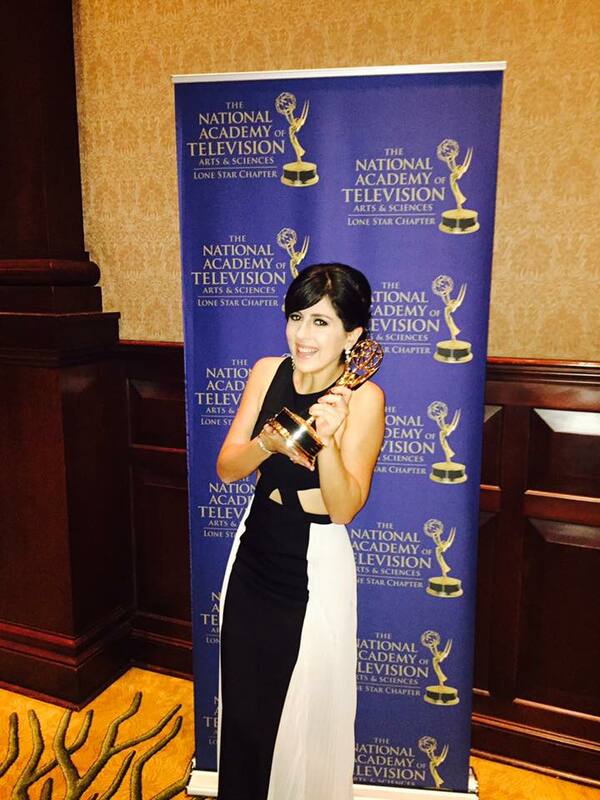 You can watch Carola’s Emmy winning news story, La Dieta de Insectos now!